The Brothers of the Night’s Watch seek a new leader from among their ranks. Jeor Mormont wishes to promote one who can improve the infrastructure of the Gift, the bountiful and undeveloped area south of the Wall bestowed to the Watch by the Starks thousands of years ago. Drawing sustenance from the unforgiving landscape of the north offers enough challenges, but whoever takes up this task must also man and defend the Wall against the onslaught of Wildlings fighting their way into Westeros. Many brothers now compete to build, defend, and do what they can to protect Westeros, but only one shall rise above their brothers to become the new Lord Commander. But, be wary—the north holds many dangers, and winter is coming. 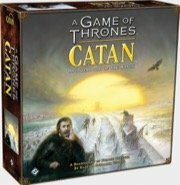 The battle to defend the Realms of Man begins in A Game of Thrones Catan: Brotherhood of the Watch, a strategic game grounded in the engrossing world of George R. R. Martin’s A Song of Ice and Fire series and adapted for Catan by Klaus and Benjamin Teuber.